(Nanowerk News) University of Melbourne researchers' work on bioinspired nanoscale colloidal systems is an example of the significant interest that the design and fabrication of nanostructured colloidal materials has created among scientists. Nanostructured colloidal systems are for instance studied for use in nanoscale drug delivery systems and they also find use as building blocks for nanosystems. To realize such nanostructured assemblies, researchers must develop methods to modify colloid surfaces in a controlled manner as well as manage their facile assembly into organized functional structures. Professor Frank Caruso, who is Director of the University of Melbourne’s Centre for Nanoscience and Nanotechnology and leads the Nanostructured Interfaces & Materials Group (NIMS) in the Department of Chemical and Biomolecular Engineering, and his group have pioneered the modification of colloidal particles with ultrathin polymer coatings. "Many of the systems currently under development, particularly those for bioapplications, draw their inspiration from naturally occurring structures" says Caruso. "That is, by mimicking the supramolecular architecture of structures found in nature, one can prepare complex materials capable of highly sophisticated functions. Core–shell particles and their counterpart hollow capsules are two classes of colloids that form the basis for the generation of more complex colloidal systems that can be designed to mimic biocolloids." Caruso, together with first author Alexandra Angelatos and co-author Kiyofumi Katagiri, all from NIMS, published their recent findings in a paper titled "Bioinspired colloidal systems via layer-by-layer assembly", published in vol.2 (2006) issue 1, of Soft Matter. In this paper the researchers provide an overview of their recent work on the modification of core–shell particles and multilayer capsules with functional materials to produce intelligent colloids for various bioapplications. The scientists prepared optically addressable colloidal carriers by infiltrating light-absorbing gold nanoparticles into the shell of polyelectrolyte multilayer capsules. The gold nanoparticles within the capsule shell absorb in the near-infrared (NIR) region (700–1500 nm) where most tissues show only weak light absorption, and because the pulses of NIR laser light required to induce release are short, the laser light energy is effectively confined to the capsule shell. Consequently, laser-induced release may be achieved in vivo without significantly damaging surrounding tissue and the encapsulated biomaterials. "We have also prepared colloids functionalized with (i) robust inorganic-based lipid coatings and (ii) asymmetric lipid bilayer membranes" says Angelatos. "The former shows potential for bioapplications where they promise biocompatibility. For instance, the silanol groups present within the membrane have an affinity for, and promote the formation of, bone." The lipid bilayer membranes are attractive for a range of applications, notably cell membrane modeling (since the plasma membrane of a cell comprises an asymmetric distribution of phospholipids), drug delivery, and transfection. Caruso explains that targeted delivery may be achieved through either passive targeting (i.e., using colloids with prolonged circulation and selective target localization properties) or active targeting (i.e., coupling specific targeting ligands to the colloid surface to enhance interaction with target cell membranes). "We have successfully functionalized the surface of core–shell particles with specific targeting ligands (monoclonal immunoglobulin G antibodies) which represents a key step towards more efficient drug/gene delivery" he says. Caruso concludes: "We anticipate that, with further development, the systems highlighted in our Soft Matter publication will make an important contribution not only to the understanding of biosystems, but also in the future application of bioinspired colloids in nano- and biotechnology." 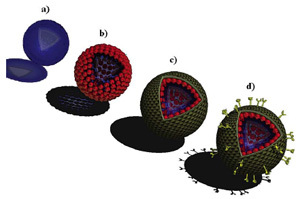 "Functionalization of Colloids with Robust Inorganic-Based Lipid Coatings" (Dec. 2004) in Macromolecules.